Securitas UK hosted its annual Community Awards on Thursday 13th September. In its ninth year, the Community Awards recognise the outstanding efforts of Securitas teams and individuals over the past year. Winners were awarded in ten different categories; outstanding act, leadership, team, safety first, innovation, community, helpfulness, vigilance, integrity and core values. This year’s finalists were all quarterly Community Award winners, nominated during the year and judged by a panel of Securitas colleagues. The University of Bedfordshire was announced as winner of the Good Customer Award with William Hill highly commended. The award recognises customers who work in partnership with Securitas to raise security standards and shape best practice in the industry. 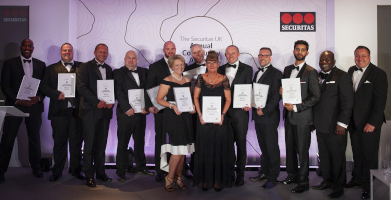 Brian Riis Nielsen, Country President & Managing Director at Securitas UK commented: “Many congratulations to this year’s winners and finalists – they are a credit to both Securitas and the security industry. They embody our core values of Integrity, Vigilance and Helpfulness and represent the commitment, bravery and passion behind our six protective services. Securitas raised £1300 on the night for charity partner Wooden Spoon. Established in 1983, Wooden Spoon has distributed more than £26 million to over 700 projects, helping over 1 million disabled and disadvantaged children.